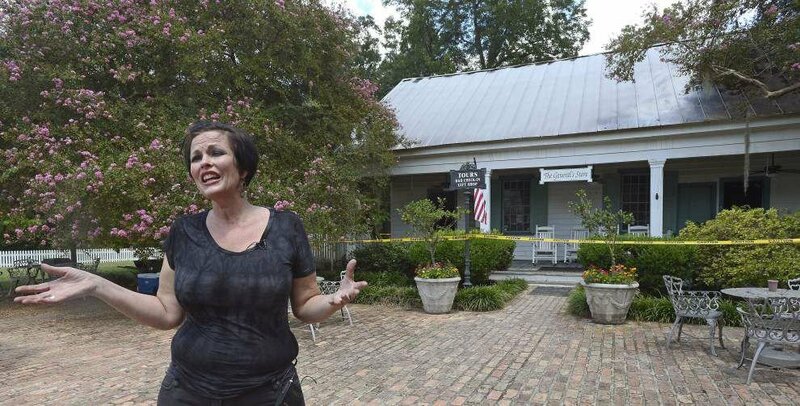 Advocate staff photo by BILL FEIG -- General manager Teresa David talks about the fire at The Myrtles Plantation Home gift shop known as The General's Store, background. 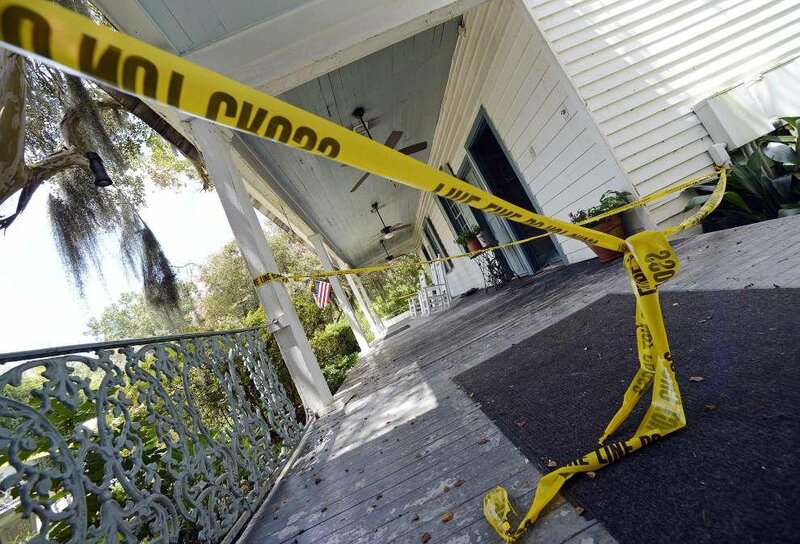 Advocate staff photo by BILL FEIG -- Caution tape marks the area of the fire at The Myrtles Plantation Home gift shop known as The General's Store. Advocate staff photo by BILL FEIG -- Items rescued from the fire at The Myrtles Plantation Home gift shop known as The General's Store. Advocate staff photo by BILL FEIG -- Fire at The Myrtles Plantation Home gift shop known as The General's Store. Advocate staff photo by BILL FEIG -- The back of the building where the fire is thought to have started. Caution tape marks the area of the fire at The Myrtles Plantation Home gift shop known as The General's Store. Photo by Natlie Wood -- Firefighters battle a blaze at the gift shop of The Myrtles Plantation. Photo provided by Holly Walker -- Firefighters battle a blaze at the gift shop of The Myrtles Plantation. Photo by Natalie Wood -- Firefighters battle a blaze Wednesday night at the gift shop of The Myrtles Plantation in St. Francisville. Jules Haigler was just finishing dinner with friends at The Carriage House Restaurant across a small courtyard from the main house at The Myrtles Plantation on Wednesday evening when a guest ran in screaming that the house was on fire. Haigler, house docent at The Myrtles Plantation, ran outside and saw smoke coming from the roof of the building. It wasn’t from the main plantation house but instead from the building just feet away used as the gift shop, laundry facilities, plantation offices and guest breakfast spot. As someone called the Fire Department, The Myrtles Plantation staff made sure all of the guests were safely out of the main building. It was about 8 p.m., and for the next two hours, little could be done as the staff watched as the oldest building on the property burned. “There were flames that looked like they were reaching for the house,” said Teresa David, general manager at The Myrtles Plantation. In the few minutes it took her to get to the plantation home after hearing everyone was safely outside, David expected to see the whole complex fully engulfed in flame. However, with only about 10 feet separating the smaller building, David said firefighters did an amazing job of putting a barrier between the two structures, and by Thursday morning, there wasn’t even a scorch mark on the main house. “Everything seemed so organized. Everybody was so calm,” David said. Even the owners, John and Teeta Moss, were calm on the phone after hearing that everyone was safely out of the house. Firefighters from St. Francisville Fire Department, West Feliciana Fire Protection District No. 1 and the Zachary Fire Department responded to fight the fire for about two hours and remained several more hours to make sure all the hot spots were extinguished. What has been referred to as the “gift shop” at the plantation has much more historical significance than just selling postcards. The burned building was the original home of Gen. David Bradford and his family while The Myrtles Plantation main house was being built until it was complete in 1796. Although there was substantial damage, David said, the most severe damage appears to be in an extension of the building constructed in 2008. Most of the original structure, which is celebrating its 220th birthday this year, is solid. It appears, she said, that as the fire and firefighting went on, Sheetrock came down from the ceiling and helped to provide protection to the floor. “We feel very fortunate,” David said. Fire is always a concern in older, historic homes, and David said the owners of The Myrtles Plantation made it known that they wanted the staff to be careful. Rules like no candles in the rooms, specific designated smoking areas and limited electrical outlets in some areas are all designed to help minimize the risk, she said. Helen Williams, director at the West Feliciana Historical Society Museum, said this isn’t the first fire that has damaged and, in some cases, destroyed historical homes in the parish. “We’ve lost a lot of them in the past,” she said. Old newspaper clippings at the museum account for some of those plantations lost, including the Greenwood Plantation in 1960, Waverly Plantation in 1972 and Beech Grove Plantation in 2007, although that one had been moved to the parish from St. Gabriel in the 1960s. As for The Myrtles Plantation, the legacy as “One of America’s Most Haunted Homes” will go on. Guests still were being housed and reservations honored on Thursday. Although organized tours were suspended for the day, visitors still were invited to look around, take pictures and enjoy the scenery. Electricity was expected to be restored to the main house Thursday evening, and although the gift shop won’t be open for a while, the rest of The Myrtles Plantation, including evening tours and The Carriage House Restaurant, will open as normal Friday.